The history of Bangla literature has gradually developed over pursuit elements of many litterateur. 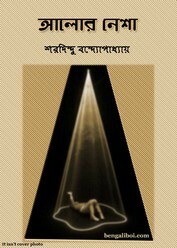 In this literary pursuit, the well-known writer Sharadindu Bandyopadhyay has taken a great part. His short stories are an invaluable resource in Bangla literature. In the book "Alor Nesha", there are some of the most famous extinct stories have been assembled together in this book. Although all these stories have been written many year ago but there is still an innovation feel in its. There are fifteen stories in this collection, these are- 'Alor Nesha', 'Bhalobasa', 'Andhakare', 'Mukhos', 'Asamapta', 'Gopon Kotha', 'Digdarshan', 'Jashmin Deshe', 'Gita', 'Sekalini', 'Dui Dik', 'Bhutur Chandobindu', 'Baghini', 'Charitra' and 'Gharidaser Guptakotha'.